When you have a small home, or a small space in general, you must make space where there is none. In other words, improvise, experiment, and maneuver as much as you can. The reality is that nowadays, apartments are getting smaller. Singapore has limited land which results in building smaller flats. It is hard to create something out of nothing. However, do not worry, we’ve got you covered. This one might sound unconventional, but just think about it. While most people prefer to have the wall in the living room, with nothing behind it, one way to add space is to put a TV feature wall between your dining area and your living room. This way, you separate the rooms, and you have an extra wall for accessorizing in the living room. We mentioned an idea with adding walls, and that one adds a multifunctional element to your home. However, if you want to keep things simple and clean, you can remove almost all of the walls in your apartment. This way, you get a larger living space, but you trade off your privacy. So, think about it. Gone are the days when the dining table was just a dining table and nothing else. 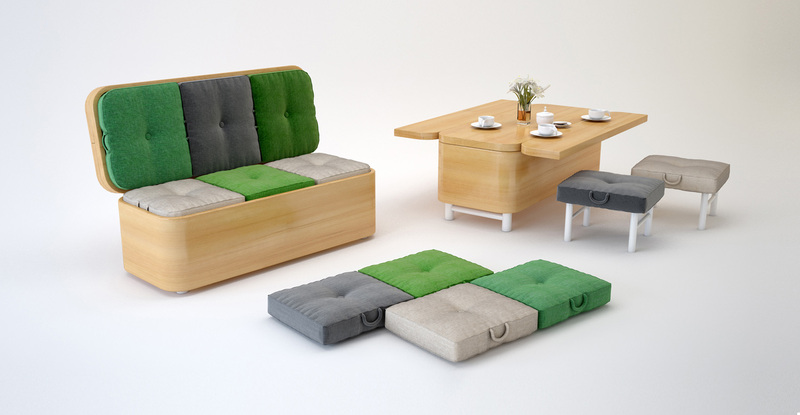 Nowadays, the furniture and the apartment in general tends to be as much multifunctional as possible. Try to utilize one space for several functions. For example, the dining table can be your office corner when you are not eating, and you can place your laptop there. There are tons of multifunctional furniture elements for the bedroom, living room, etc… A club table in the living room can also be a storage corner. These are just simple ideas, but the main thing is to think outside of the box. And whenever you buy something, ask yourself what you can use it for. One way to create more space in the apartment is by connecting the kitchen area with the dining area. You can do this by linking the kitchen island or the countertop with the dining table. Open the walls of the kitchen, and connect it with the dining room. You are getting more space, and the whole room looks more spacious. Utilizing vertical and hidden storage is the best way to carve space in an apartment with little to no space. Hidden storage options are the new “it” factor on the market, and the most obvious one is the storage under the bed. Other solutions include hanging accessories on the back of doors, vertical storage in cabinets, shelving in double tiers in closets and much more. Try to maximize the vertical potential of your room, meaning go for furniture (wardrobe, closets) that are built from floor to ceiling. The good thing when owning a small apartment is that you don’t need or have space for much furniture. But the furniture you put must count. Therefore, do not save on eye catching elements and stylish furniture. You have few pieces, so make them count. For example, in the bedroom you can install a beautiful headboard, or an entertainment center that will catch the attention of your guests. This hack works only if you have high ceiling. If you can install lift beds, and lofted designs, you can practically make two rooms out of one. And the best thing is that the space under the bed can be used as a closet or any type of storage area.